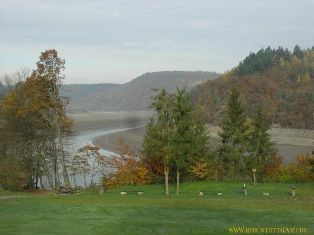 Stuttgart - The Stuttgart parish’s family retreat was held from October 30 to November 4, 2010 with the participation of 47 people (from 9 families). All of the participants bravely faced every challenge, difficulty, and joy of our shared outing. One experienced priest from Volgograd, Fr. Sergius Popov, ably led our daily lives, allowing us to plan on our own, organize our own activities, do our own analysis, and make and correct our own mistakes. For instance, during the planning of our daily schedule, all of the participants expressed their desire to have the adults start their day with an akathist at 7 o’clock (8 o’clock in the summertime), because everyone wanted to relax and sleep in. Fr Sergius said nothing in opposition, even though he knew from the start what the result would be. And when we gathered to pray for the first time, we all understood that it was too late in the morning. Both the adolescents and little children had already gotten up and were demanding their parents’ attention, distracting us from our prayer. The following morning, we all agreed to start our prayers one hour earlier. From the start there arose problems among the children and among the parents, but the shared resolution of those problems with the participation of our wise priest, as well as the prayers of every participant for one another, and our common prayer for our neighbor, all facilitated our unity and our feeling ourselves to be one family. So what happened? A great many things, about each of which much could be said. 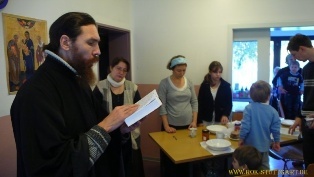 There were no small tasks at the retreat, from kitchen duty to the Divine Liturgy. The daily event schedule illustrates how truly full our days were, while the participants’ impressions of everything they had experienced and opinions on how important it is to hold such retreats in the future, can be read in the participants’ reviews, which we include below. On behalf of all of the participants of the family retreat, we sincerely thank the Holy Synod and the Fund for Assistance to the Russian Orthodox Church Outside of Russia, for his approval and blessing of our undertaking and for its financial support, respectively. Without this help, we would be unable to realize all of our intended plans. The Fund’s financial assistance helped resolve our basic material concerns (paying for a cabin and providing aid to allow large and underprivileged families to participate in the retreat). The participants of the family retreat, parishioners of St. Nicholas Church in Stuttgart, Germany. Our family, the Jetters, came to the family retreat five-strong: mother Irene, 29 years old; older daughter Nadezhda, 8; older son Nicholas, 7; younger son John, 4; and younger daughter Paula, 7 months. The family retreat gave all of us a great deal: it gave me renewed strength to confess my faith, strength that I often lose in the everyday hustle and bustle; it gave Nadezhda the feeling that she is not some black sheep among children, and is not alone in wearing a cross, praying, and living in the church community, without having to be constantly asked about it, as she is in school; it gave Nicholas fortitude in prayer and, even more importantly, likeminded friends; it gave John friends; and little Paula just got to be with her mom. Our favorite activities included a fair, archery, war games, dancing, workshops, girls’ night, parental teaching tips, a mothers’ gathering in the kitchen, discussions with the priest and receiving his spiritual instruction, as well as a performance by the families and the feast day of the Kazan Icon of the Mother of God, with a luncheon. I really enjoyed that. We would be happy to participate in the next retreat, as well, maybe even with the children’s father. We ask your prayers for Fr. Sergius and his family and for the possibility of holding such a retreat in the future. I came to the parish family camp for my two boys. Back when I was working in a youth club in St. Petersburg, I already absolutely clearly understood that one of the most important tasks a parent can have is to provide an Orthodox “habitat.” This isn’t easy in Russia, let alone in Germany. The value of an opportunity to live together, to better get to know those with whom you commune from one Chalice, cannot be overstated. Life in such camps lays the foundation for the relationships that will strengthen and unite our children in the future. 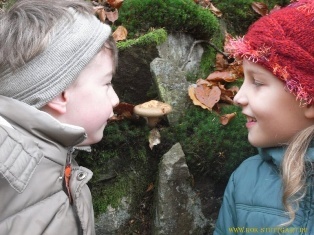 If they will have shared memories, shared joys and struggles, shared experiences, then this can help them later on in life. I offer my deepest respect and gratitude to the organizers for their labors, to our dear deacons, Fr. Alexander and Fr. Vladimir Boshman, and Matushka Svetlana. And to Fr. 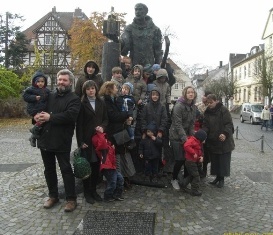 Sergius, who, having left his five children at home, flew in all the way to Germany to help us with ours. And to the Fund for Assistance to the Russian Orthodox Church Outside of Russia for their financial assistance. The financial aid was especially important, but no less significant is it that those things you consider important are such not only for you, but for others, as well, who are willing to help. May the Lord bless them all. Help FFA improve - take a survey!